We are pleased to announce a gorgeous litter of 2 f1b petite mini Goldendoodles born December 21st. Based on Sunshine their 22 pound Mini Goldendoodle mom and Pooh their 11 pound Mini Poodle dad, we expect this litter of f1b petite mini Goldendoodle puppies to be 10-23 pounds full grown. These two little boys have been a joy to raise. We believe they will make outstanding family members for a few fortunate forever homes. Vance is an adorable puppy with a huge heart for people. 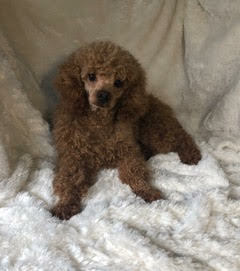 He has a gorgeous dark red coat that is super soft and curly. He will be a great addition to the lives of any lucky family or individual! VANNA is a cuddly little girl with a love for life. Her pretty red, curly coat will certainly turn heads on walks through the neighborhood! VANNA is loving, cheerful, and gentle.